O Mary, who entered the world without stain, obtain for me from God that I may leave it without sin. Blessed be Our Most Holy Mother and Blessed be Her Immaculate Conception by the power of the Holy Trinity, Father ,Son and Holy Ghost, Amen. 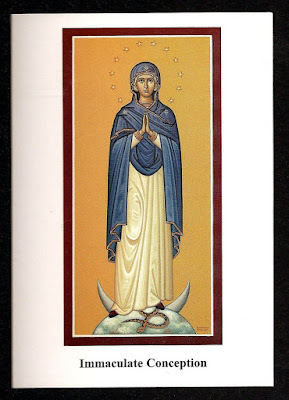 Curious holycards, the Inmaculate Conception in an Orthodox-icon style. Orthodox Christians don't share with us the dogma of the Inmaculate, but they also think that she was pure since the instant of her conception. diddleymaz - Thank you for your daily contribution....I've had a mini-miracle happen today also. God be praised. Meldelen - I learn so much from all of you. I didn't know the Orthodox Christians don't share with our belief in this dogma. Let us pray for them...they are so close to the truth. Hello, I love the image for the Feast of the Immaculat Conception you have posted. Is there any chance you have this image in a high resolution file so I may print out a copy for personal use?